The handy, lift-top surface of this table provides a stable surface for serving snacks a a party or holding your laptop while you're working or surfing the net. The bottom shelf provides an excellent place to display decorative objects or framed photos of your family. 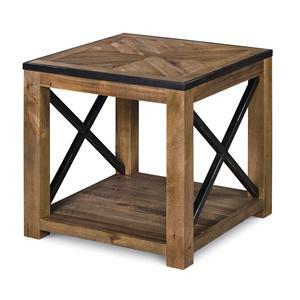 The metal details on the table tops as well as the X lattices on the sides give this cocktail table a rustic feel. 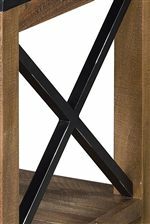 The combination of wood and metal on this piece make it a great addition to any casual or country style home. 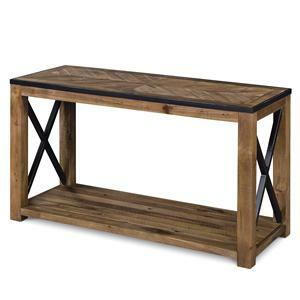 The Penderton Rectangular Lift-top Cocktail Table by Magnussen Home is available in the area from BigFurnitureWebsite. A hinged mechanism allows you to pull this table top up and towards you for convenient surface storage space or a simple workspace for your laptop. The raised top makes it easy to reach snacks and drinks, a great option for a home with younger kids who are prone to spilling. Those with limited mobility will also appreciate being able to reach remotes or books with ease, and when not in use the table top can be pushed down for a more stylish appearance. 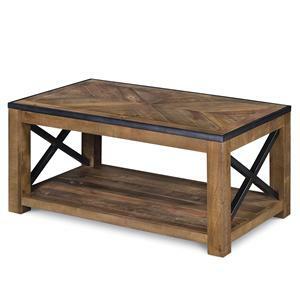 Reduce living room messes and stains and easily reach important items with this table's lift top surface. 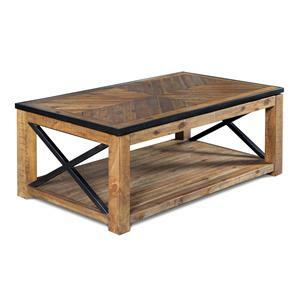 The Penderton collection is a group of occasional tables perfect for your rustic style home. 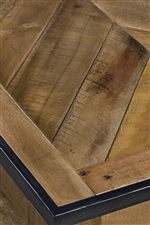 Distressed wood panels make up both the table tops and bottom shelves of each piece and are accented by the metal tube edges. 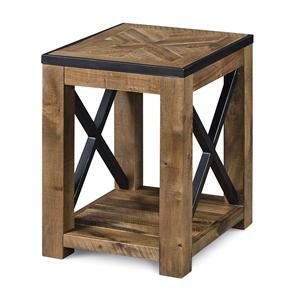 Sturdy square block legs are used on each corner with metal X cross stretchers on each side. With their unique shape and accent materials, the Penderton tables make a striking statement in your living room. The Penderton collection is a great option if you are looking for Industrial Mission furniture in the area. 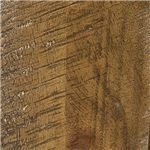 Browse other items in the Penderton collection from BigFurnitureWebsite in the area.